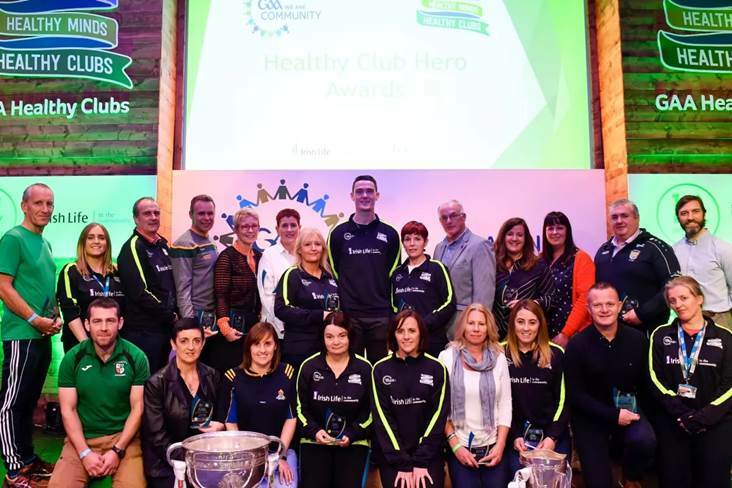 The closing ceremony at the Healthy Club Conference in Croke Park last weekend saw a special group of people honoured for their exceptional efforts in promoting the GAA’s Healthy Club Project. The Healthy Club Project started in 2014 with just 16 clubs, four from each province, involved. It currently engages 150 clubs, multiples in each county. The project aims to broaden the traditional boundaries of a GAA club, turning clubs into hubs for health in the communities. It involves a partnership with Healthy Ireland, the National Office for Suicide Prevention, the HSE, and is proudly supported by Irish Life. Participating clubs were asked to nominate their Healthy Club Heroes: someone who has gone above and beyond the call of duty in serving the health and wellbeing needs of their clubs’ members and the communities they serve. Dublin All Ireland winner, All Star, and Player of the Year nominee, Brian Fenton, was on-hand to present the recipients with their awards in Croke Pak on Saturday. As the Healthy Club Officer in her local club, Maria has brought great levels of enthusiasm and passion to the role. This is extended to beyond those involved in the GAA club, and has been directly involved this year in implementing winter cards nights, starting a book club for the community, and was a leading figure in leading the way for the Gaelic for Mothers & Others initiative in the club. She has been a central figure in getting older people and those not affiliated with the GAA involved. Terence is a central club figure, holding down the roles of Club Secretary, Healthy Club Co-Ordinator, and membership on the Club Committee. Terence spearheaded Healthy Club projects in the local area such as Operation Transformation, Walk & Talk, Annual Fun Day, Mental Health Awareness Week, the Rest-a-Heart Campaign and the AED Awareness Campaign. Fully immersed in the club, Terence is the coach of the U-18 team, is in charge of child protection guidelines, as well as codes of conduct for players, coaches and parents. The chairman of the local club, James set up the Men’s Shed in the locality, providing a much-needed social outlet to men in the area. He has launched several initiatives aimed at making the games more inclusive, more fun and less pressurised, with ideas such as “silent side-lines”, cyber-education programmes and skills academies, focused on teaching all children the basic skills of the game. James is heavily engaged with members of the communities, and launched a survey to include all members of the GAA family, including fans, players, parents and referees, to better understand where improvements could be made. Mairead is the Healthy Club Officer in her local club. She has been directly involved in the co-ordination and organisation of the annual Darkness into Light Walk for all members of the community, as well as launching and implementing healthy eating initiatives. She is also an active member of the executive of the club. Mary is the lead member of the Healthy Club and a member of the club executive. Her vision led to her club being the first Galway club to set up the initiative. Mary is a very active member, heavily involved in all fundraising efforts, and encourages people across all demographics to get involved in the GAA club. She organises a monthly lunch and bingo game for older members of the locality, as well as a weekly card game and an annual choir concert. Tom is an active coach and member of the Healthy Club committee. He and his colleagues have led the way in encouraging the GAA club to reach out and include more members of the community, in activities such as Operation Transformation, the Spring Challenge, and strength and conditioning classes. Tom cares deeply about the health and wellness of each member, and has had a major impact on those involved. Christina is the leader of the Healthy Club drive locally, as well as being Secretary of the club. The local Operation Transformation campaign was kick-started by Christina, getting a large proportion of the community involved. She uses her position as secretary to not only look after the day to day running and administration of the club, but also to encourage the promotion and implementation of Healthy Club policies across the board. She was involved in establishing a daily walk for local people, and also led a survey across the parish to determine what people wanted to get out of Healthy Club. She targeted members of the demographic who perhaps were not as involved, and organised for a Rounders Coach to be brought in to establish the sport in the locality. Kathleen operates in a duel role capacity in her club – that of Healthy Club Co-Ordinator and Club Treasurer. She also plays a key role in the organising and coaching of Ladies’ Football in the club. She helped the club become the first in Leitrim to achieve Healthy Club Status. She is the fulcrum behind the “Million Minutes” initiative, which has encouraged locals to exercise for a million minutes in total over eight weeks. This was a community-based project, and resulted in various groups and ages getting involved and meeting every Friday to log their minutes for the week. The idea showed how it is possible to exercise in many ways. Cecilia is the Healthy Club Officer of her club. She is the club Social Media Co-Ordinator, and is active in promoting Mental Health Awareness initiatives and information. She has introduced a variety of physical activities into the community, such as tag rugby, “Couch to 5k”, hill walking, fitness classes, Nordic Pole Walking, has organised cookery demonstrations, and is passionate about developing an inclusive community spirit. Caroline was the Healthy Club Officer of the club, and has since moved on to become the Club Treasurer and County Children’s Officer. She initiated a weight-loss group in the club, sourcing a nutritionist to give talks and also starting a weekly pilates class. She was the backbone of securing non-smoking rule on the club grounds. Caroline initiated a healthy eating policy by giving homemade snacks and fruit after blitzes, organising opportunities for children to try new fruits and vegetables and secures fruit and veg for the club shop. She ensures that Healthy Club initiatives and information is visible to all in the club. She helped develop the Healthy Club Statement, Anti-Bullying policy and also created the Critical Incident Policy. She has played an active role in implementing policies for older people as well as non-sporting activities such as set-dancing. Joan is the chairperson of the Healthy Club Committee within her club. She has encouraged innovative ideas, one of which is the Healthy Clubs Recipe for Success. This involved young local people receiving tuition on how to prepare healthy meals, then designing their own which become available in local cafes, restaurants and delicatessens. In so doing, young people, business owners and customers have all become aware of the initiative, which has helped put a local stamp on the campaign. Kelly assumes the role of Secretary of her local Healthy Club Committee. She has been instrumental in organising the local Operation Transformation programme, couch to 5k, yoga classes, pilates, Zumba, circuits, netball, and jiving. This opened up the club and the community to people who may not have been involved before. Her enthusiasm and passion have been central to the successful implementation of such a wide range of activities. She initiated the setting up of online groups/messaging groups to keep people informed and to keep track of numbers attending. She also organised a very helpful evening of health checks in the clubhouse, where cholesterol, weight, blood pressure were checked, has ran talks on mental wellbeing and gambling awareness, and obtained a “no smoking” status for the club grounds. Liz is the Chairperson of the Liam Mellows Healthy Club project team. She is an encouraging and supportive leader, with a particular focus on continuing to provide services for older people, and aid their integration into the community. She has been instrumental in setting up yoga and pilates classes for a variety of age groups and abilities, and hosting a well-attended gambling awareness and healthy eating workshops. Éamon is the chairman of his club’s Healthy Club Initiative. The club covers a large catchment area, and Éamon has worked tirelessly to include as wide a demographic as he can, to ensure there is an activity to encourage the involvement of everyone in the community. He has shown visionary leadership, and would love for the club to become the hub of Healthy Club activity in Waterford. Activities run include – Club on the Move, Couch to 5K, SAOR Course, Healthy Eating, GAA.RNLI Respect the Water Campaign. Seamus is the Health and Wellbeing Officer for his local club. He has incorporated the entire community and not just the GAA club in the initiatives launched. Young mothers, senior citizens, and ex-players have all been specifically targeted for inclusion. The club won the Irish News’ “Best Well-Being Initiative” in 2018. He led the launch of “Mission Slimpossible” (resulting in a collective weight loss of 54 stone) and “Action Cancer Big Bus”, to encourage physical wellbeing and regular check-ups, which resulted in a number of referrals and one woman receiving an early detection diagnosis. Janas and Claire are the founding members of the Healthy Club team at their club. They approached the club with their vision in 2011, and have set the scene for the health and wellbeing aspect of the club and the community ever since. They undertook an audit to discover what could be done to effectively create a healthy and inclusive environment for those in the community. Their club served as a mentor club to others in the county as a model of best practice. They run low-cost weekly exercise groups, health awareness campaigns, alcohol and drug information evenings, stress management information classes as well as mental wellbeing talks and information sources. Claire is now a member of the Cork Health & Wellbeing committee while Janas is serving her second term on the national Health & Wellbeing committee in Croke Park. Stephen is the Healthy Club Leader at his local GAA Club. He has been running Fit4Life for the past 7 years through the club. This has brought members of local neighbourhoods together for a weekly social and activity-based event. He has been organiser in chief in arranging for speakers to come to the local community to inform and advise on areas such as gambling and addiction, as well as spearheading the decision to make the club a non-smoking campus. Promoting healthy eating is a passion of his, with many plans in place to promote this in the future. Maria started the “Raheny All Stars” programme, which caters for children with special needs in the club, to afford every child the opportunity to participate. Over 15 children now participate in the programme every week. She has also organised and help run “Disability Inclusion in Sports” training for coaches, including Autism awareness training Lamh sign language training. She organised yoga for children, fruit at games, and helped with the smoking ban around the club. Sinead is the active Children’s Officer in her local club. She is also the head of the local health and wellbeing committee. The committee produce a monthly newsletter containing information health and wellbeing issues, and upcoming events. They have held nutritional information evenings, organised a summer camp for children with autism, organise a weekly walking group, charity cycle, darkness into light walk, and Sinead is responsible for the overall text/messaging service, informing locals of upcoming events. She has worked tireless to turn Clonakilty GAA into an autism-friendly GAA club, with her efforts contributing to Clonakilty becoming recognised as Ireland’s first autism-friendly town. Colman holds the positons of club PRO and Well-Being Officer for the Juvenile club. He initiated the notion that the GAA club should be actively involved in promoting and informing the extended local community regarding health and wellbeing. He has united all codes of sport under one banner with the aim of promoting and improving health and wellness. He has helped organise walking groups, weekly fitness sessions for all levels, club nursery, healthy eating workshops, and has got everyone working together through his philosophy of inclusion. Seamus is the Chairman of his local GAA club. He is described as someone who shows initiative, is creative and passionate. He led the committee to research, write and publish a book celebrating 30 years of the club’s existence. He organised a successful Operation Transformation campaign, including nutritionists, trainers, and medical advisors. He also sought for the inclusion of activities such as Pilates, a life coach to speak to younger people, and made the club the first non-smoking in Sligo. Michael is the Chairman of his club’s Healthy Club Project. He has pushed through numerous health and wellness programmes, including those for mental wellness as well as physical. They also hosted gambling and alcohol awareness evenings. He has organised for numerous speakers to the locality to speak and inform on a plethora of issues. A proud clubman, Michael is involved in all aspects of the club, none more so than seeking to get everyone involved and to improve the lives of those in the community in whatever way he can. Gwen is the Health Officer and Irish Language Officer at her club. She won the Seosamh MacDonncha award for her promotion of the Irish language in Meath. She delivers a “Café agus Caint” every week in the locality to encourage the use of the “cúpla focail”. She was also instrumental in setting up the “Special Needs” programme, where there are up to eighteen members taking part in activities on a weekly basis. The group were invited to meet Prince Harry and Meghan Markle this year during their trip to Croke Park. Despite never having owned a pair of football boots, she is at the heart of the Colmcille’s club and the epitome of a Healthy Club Hero.